My Jamaican mother in law came to town a few weeks ago and brought not one, but two huge bags of callaloo. 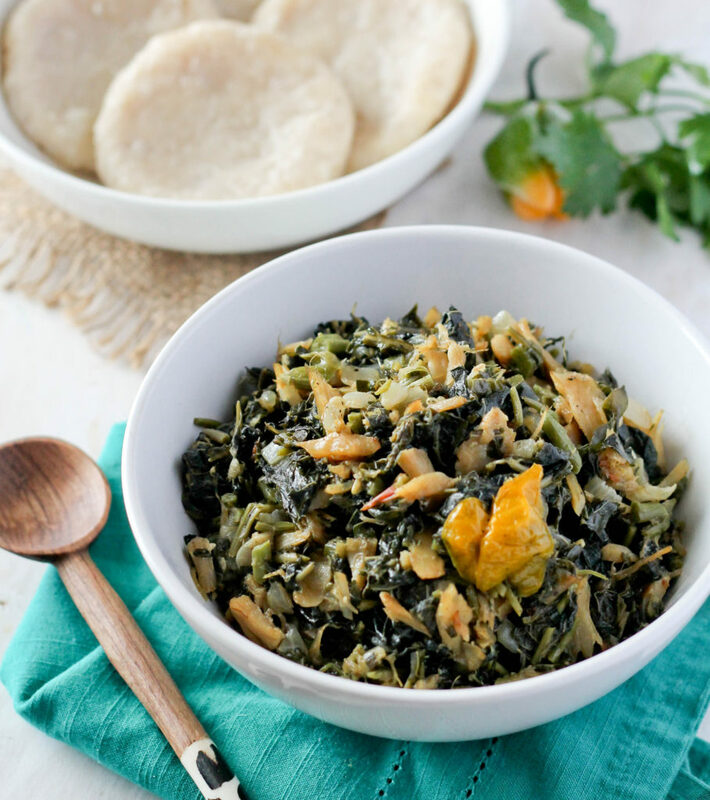 Every culture has their version of green leafy vegetable and in Guyana and the Caribbean that is callaloo. There are many varieties of what is considered callaloo – what we call callaloo in Guyana is different from the Jamaican callaloo which is different from Trinidadian callaloo. It is difficult to find any of those in the States unless you grow your own or live close to Little Guyana which is Richmond Hill, NY. It is virtually impossible to find it here in Atlanta so you either get it from someone who grows it or you grow your own. I live in a townhome with a back patio that’s definitely not large enough to grow most vegetables so growing my own is not an option. The callaloo that I got from my mother in law is enough for several meals and she was kind enough to chop it up which makes it easy to freeze; I have it stored in my freezer for future use. I decided to make a Jamaican style breakfast for my husband with some of the callaloo and a bit of saltfish. Truth be told, there was a lot of saltfish on our plates that day; breakfast was a combination of callaloo and salt fish, ackee and salt fish and boiled Jamaican dumplings. Now I must say, I’m fried bake girl to the core but every now and then I will eat a boiled dumpling or two. Both recipes are fairly simple and quick as any breakfast should be. 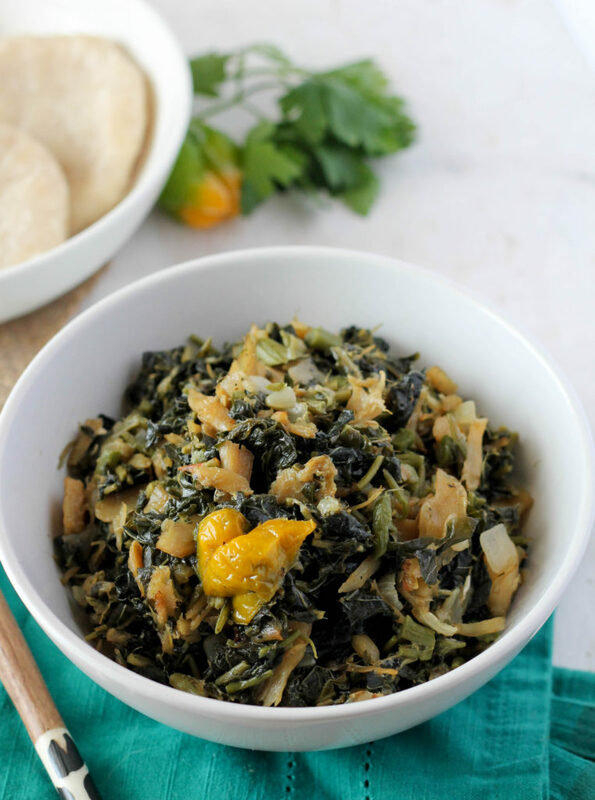 The Callaloo and Saltfish can go beyond the breakfast table and would be amazing served with dhal and rice! I made enough dumplings to have a little bit leftover because I’ve been told that frying the leftover boiled dumpling the next day is the way to go. To make the callaloo and saltfish: remove the salt from the saltfish by either soaking overnight or boiling. If boiling, boil the salt fish in water for about 10 minutes, repeat this process 2 to 3 times using fresh water each time. If using saltfish with bone and skin, be sure to remove and discard both. Flake the saltfish into small pieces. Heat oil over a medium fire in a medium sized pot. Add onion, garlic and pepper and cook for about a minute while stirring occasionally. Add saltfish and cook for an additional 2-3 minutes then add the callaloo. 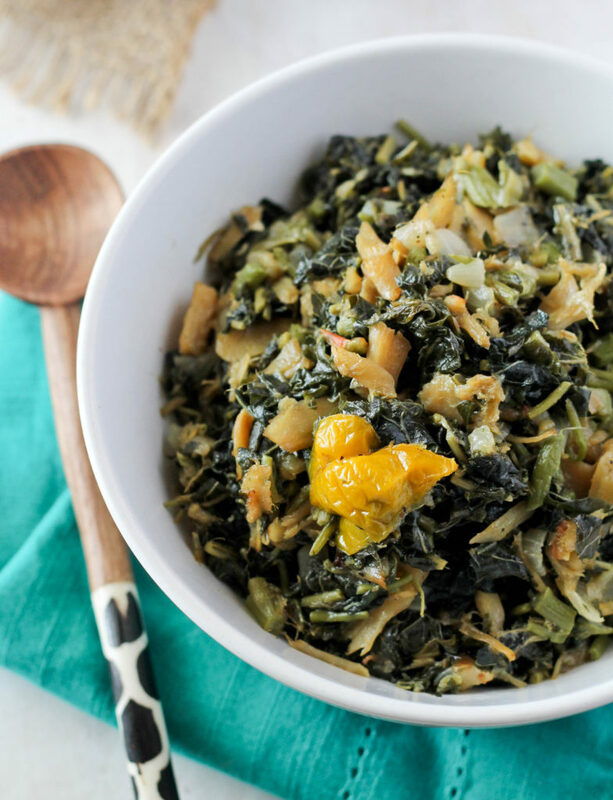 Allow the callaloo to wilt a bit before stirring all the ingredients together. Add black pepper and water and bring to a boil. Cover and allow to cook for about 15 minutes or until all the water has evaporated. To make the boiled dumpling: Mix flour, ¼ tsp salt and water to form a stiff dough. Break into 8 equal pieces and flatten with the palm of your hands. In a medium sized pot add about 6 cups of water and 1 tsp salt and bring to a boil. Add dumplings and allow to cook for 20 minutes.